In January 2016 I am honoured to be volunteering for Street Aid, and I’d love for you to get involved too. Street Aid was set up by a valiant team of Street Food Traders from London and beyond to provide much needed help to the refugees in Calais. We will be travelling to the refugee camp to deliver food to thousands of people over 4 days in the harsh cold of winter. To help in the run up I have organised an auction, in Peckham, to help raise some more much needed funds to support the trip and ensure it is as successful as it can be. 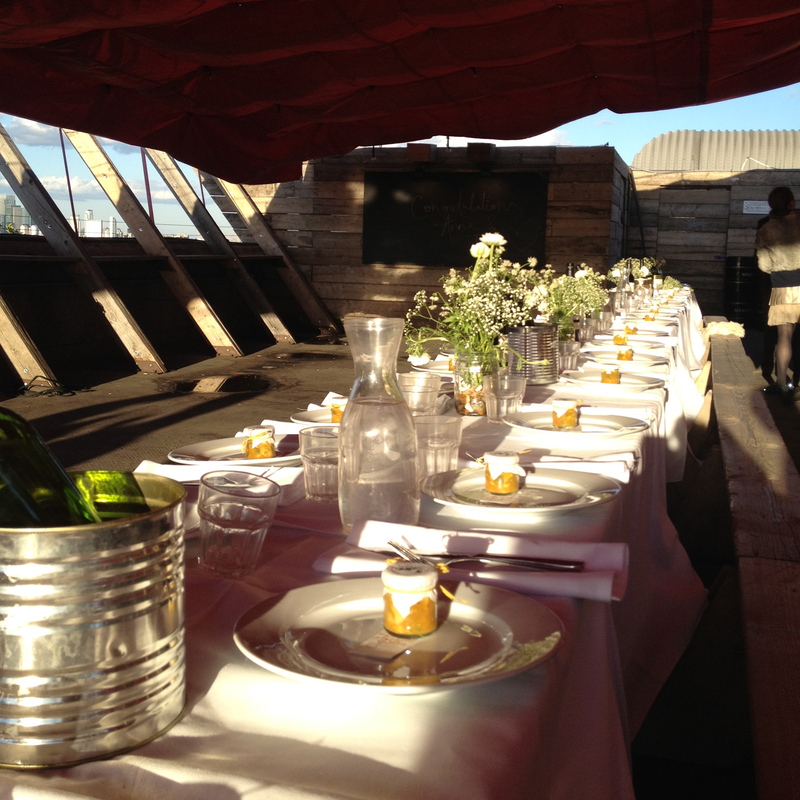 The kindly restaurants and cafes of Peckham and Camberwell have donated dinner for two which you can bid to win at the event! It is easier to dig into your pockets at Christmas and just think of the reward in January when your winning certificate encourages you out of the house for a cosy supper in a fine Peckham establishment! Please bring CASH to bid at the auction! And be ready to dig deep. Does your granny really need that cashmere jumper? Surely she’d be happy with just a pair of gloves?! And you will rest easy in the knowledge that you have done your bit to support a cause which is so desperately in need. And of course, mulled wine and nibbles will be provided. OPENING 2016! 2 starters, 2 bao, 2 deserts and a bottle of sake AND the chance to be the first 2 people through the door on their opening day! 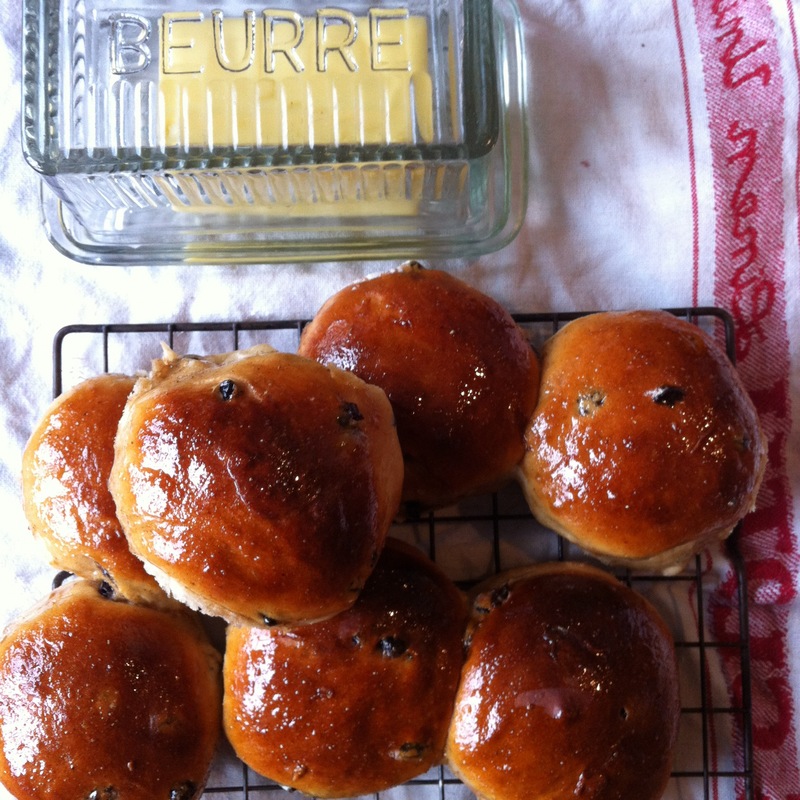 My mum has inspired me with her fantastic new blog and asked me to help by writing a recipe for children. Her characters Doll Splinter and Egg O have been up to all kinds of mischief over at www.julietsdoll.com including baking biscuits for a picnic. 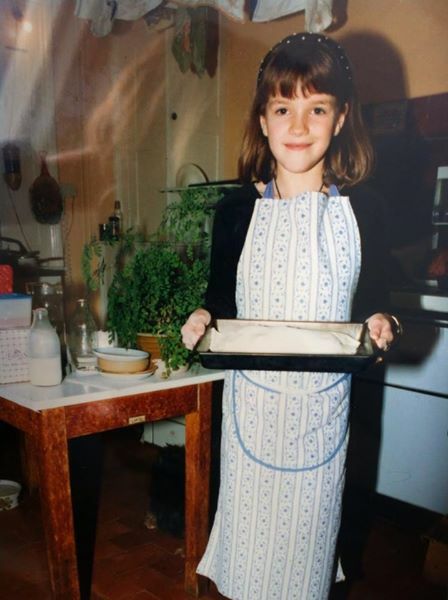 I have loved cooking and baking since I was a little girl. This is me baking at Christmas when I was about 8 years old. 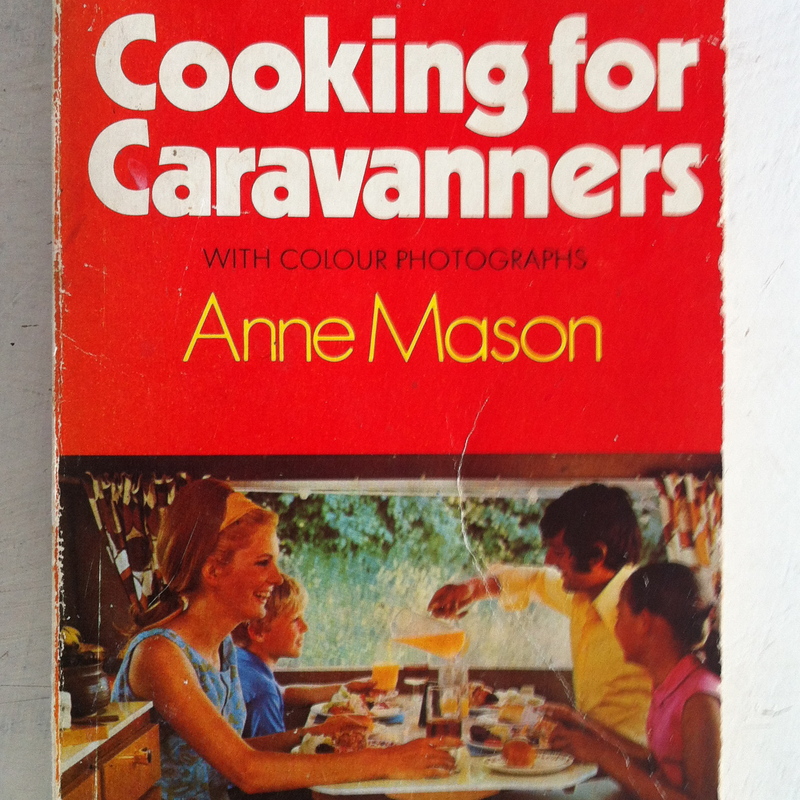 I am in my Granny’s kitchen, I used to love helping. 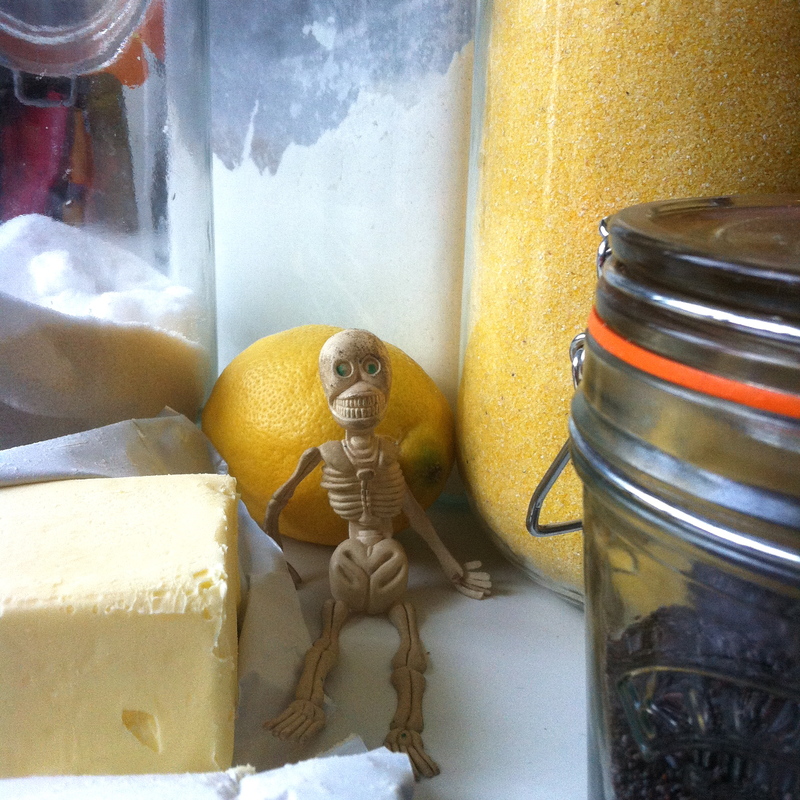 To write this recipe I enlisted a bit of help myself… from Skelly! Start by getting everything you need together on your kitchen table. 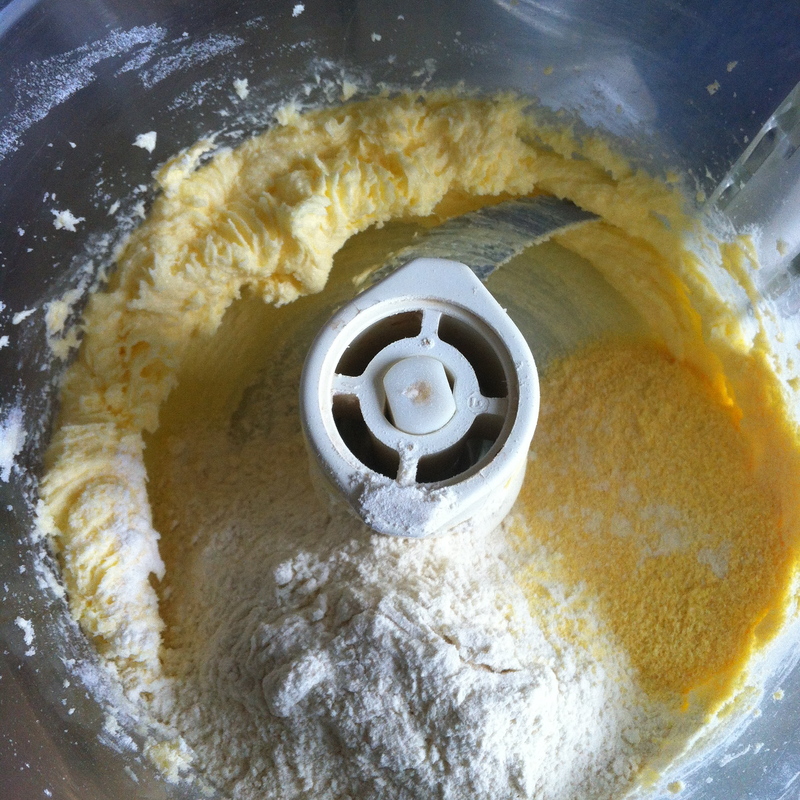 Put the butter and sugar in your whizzing machine (like my magimix in the picture below) or use a handheld whisk, or flex those muscles and use a wooden spoon, to cream the butter and sugar together. The mixture should be very soft and pale and creamy. Next add the flour, polenta and lemon peel and mix again to combine them. 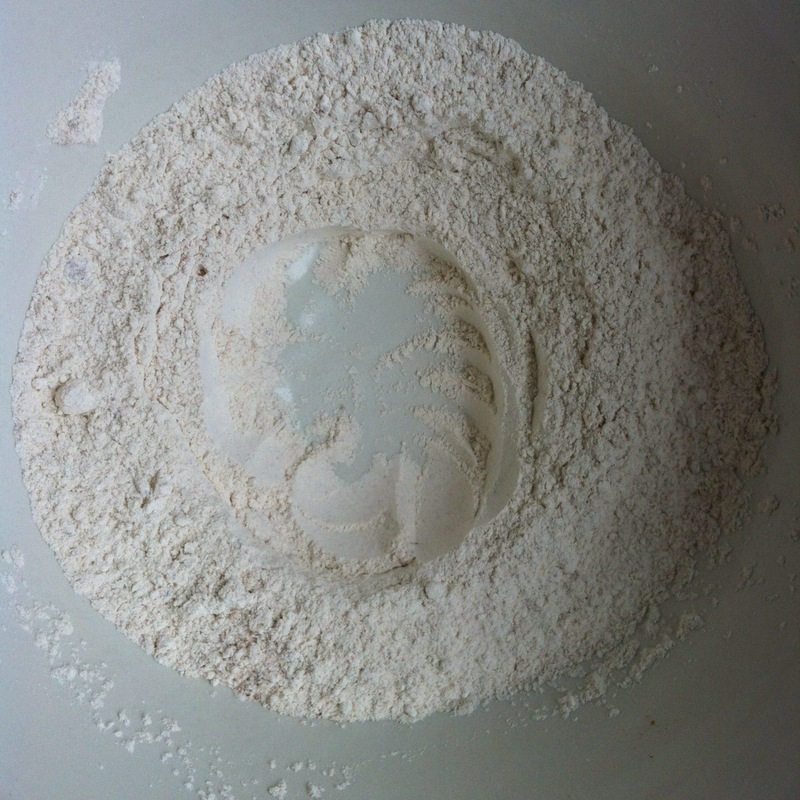 Now tip the mix into a bowl and use your hands to gently squish the mixture together into a ball. 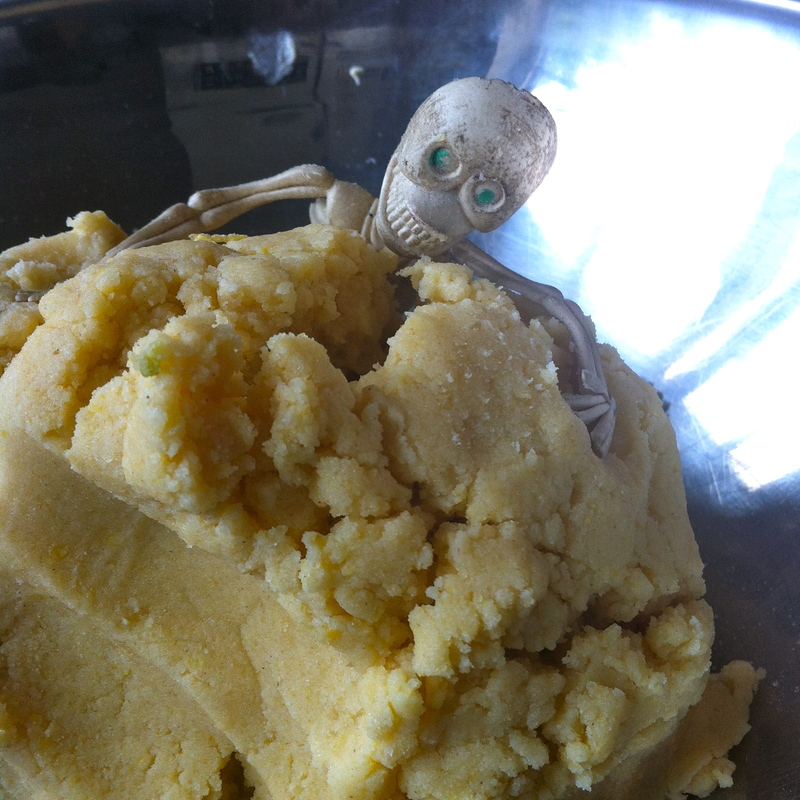 You have made biscuit dough! Skelly REALLY enjoyed this bit. 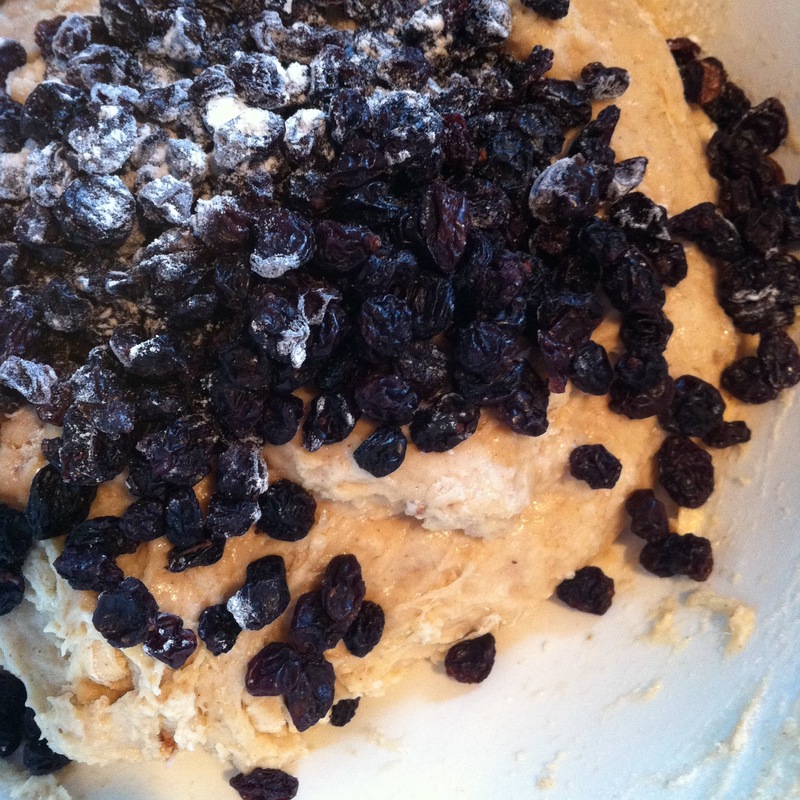 Now put the dough in a plastic bag or wrap it in cling film and put it in the fridge for about half an hour. It will be too soft to roll out now so you must be patient. 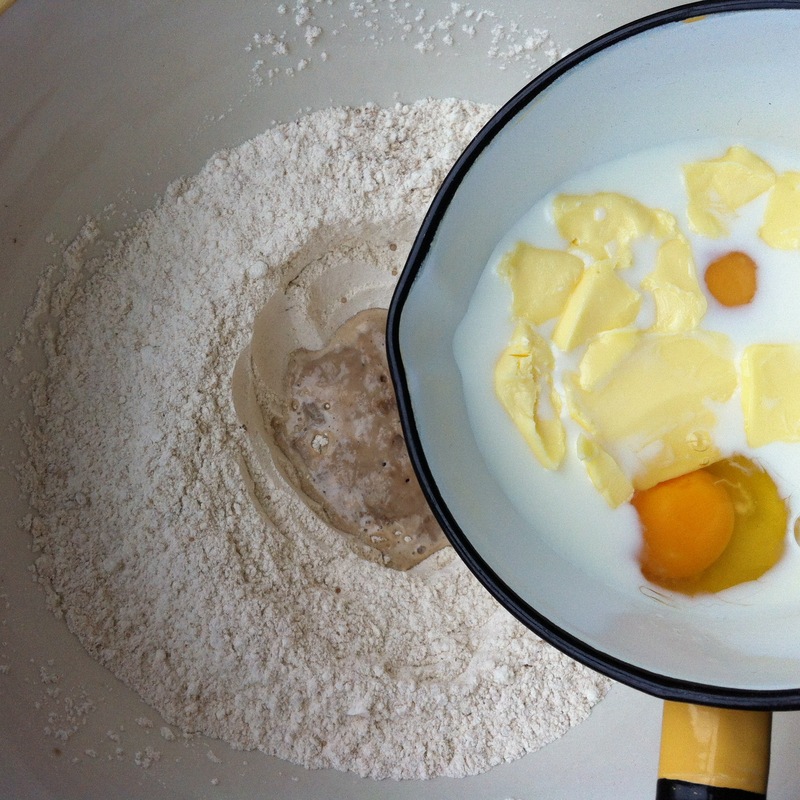 When the half an hour is up take the dough from the fridge and put it onto a table dusted with a bit of flour. 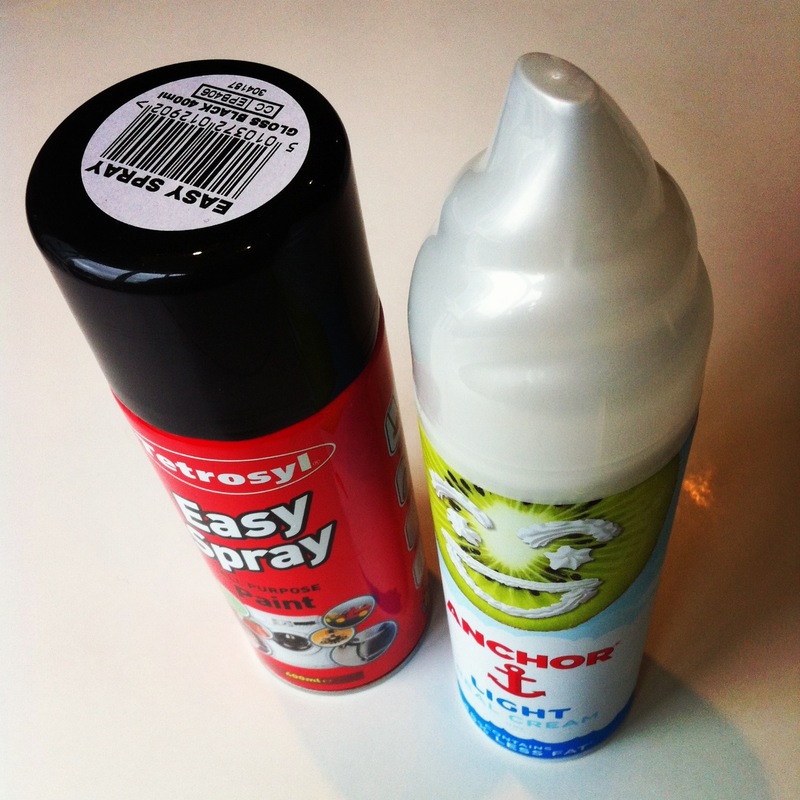 This will stop the dough from sticking to the table! Dust the top of the dough with flour too, this will stop the dough from sticking to the rolling pin! 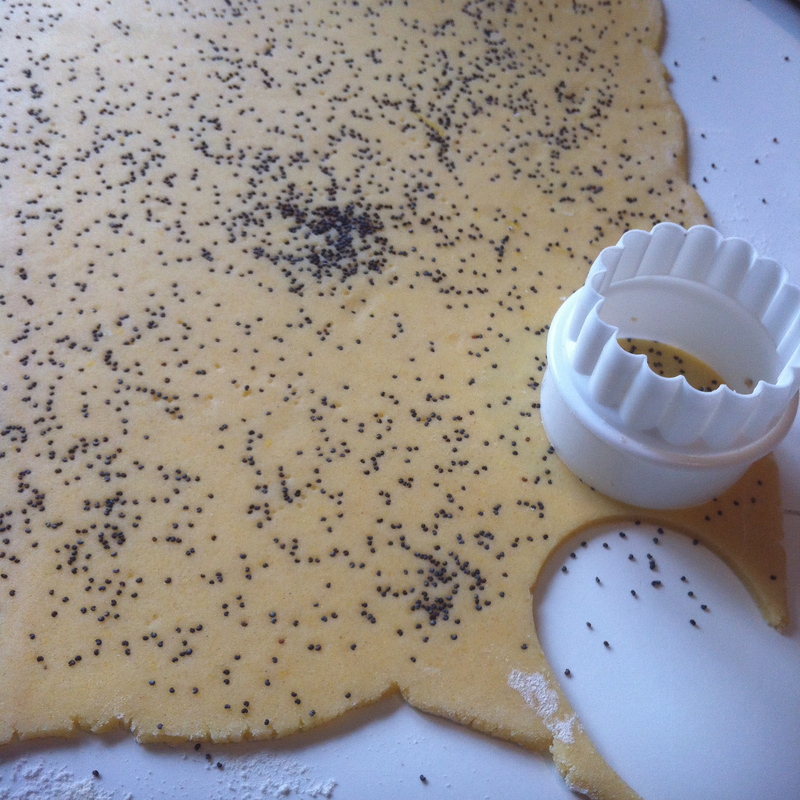 Now gently press down the dough with the rolling pin and start to roll it out. Keep dusting with flour so nothing sticks and don’t press too hard. 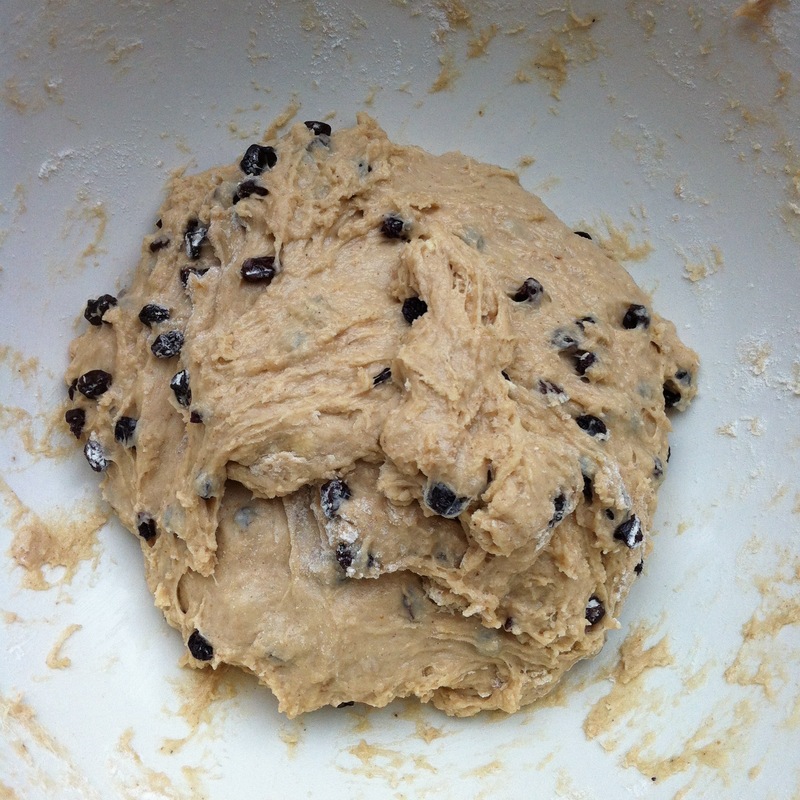 You want the dough to be about half a centimetre thick. You can actually make these as thick or thin as you like but this means you will have to adjust the cooking time. 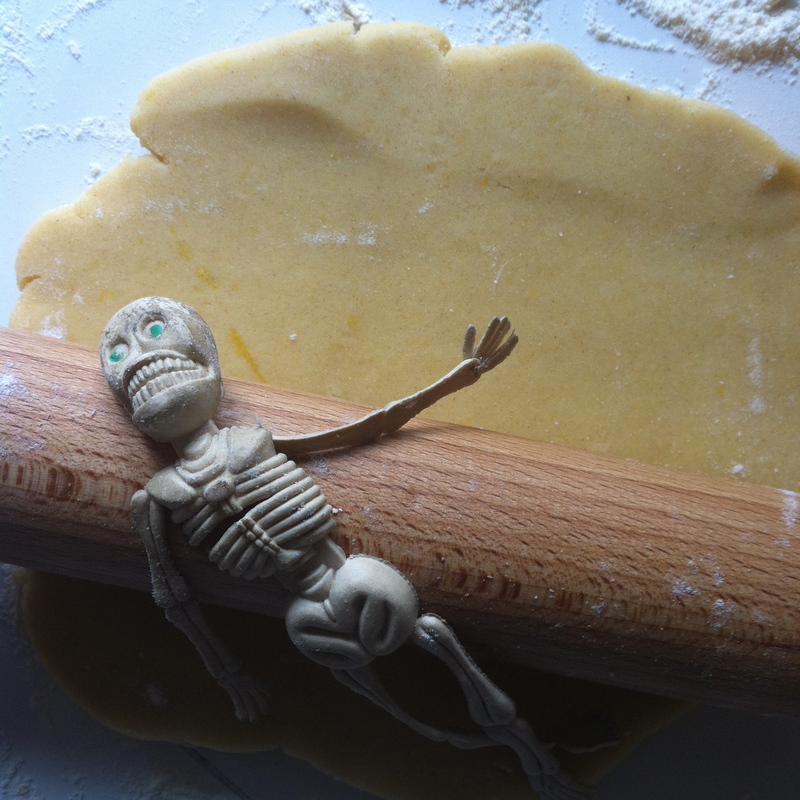 Skelly wasn’t very helpful at this point and instead just rolled about on the rolling pin..
Now sprinkle poppy seeds on the top of your dough and gently press them down by lightly rolling the rolling pin over the top one last time. Now cut out your biscuits to any shape you like! Skelly wanted bone shaped biscuits but I didn’t have the right cutter so we did circles instead. Now lay your biscuits onto the baking tray and pop them back into the fridge for another half an hour. 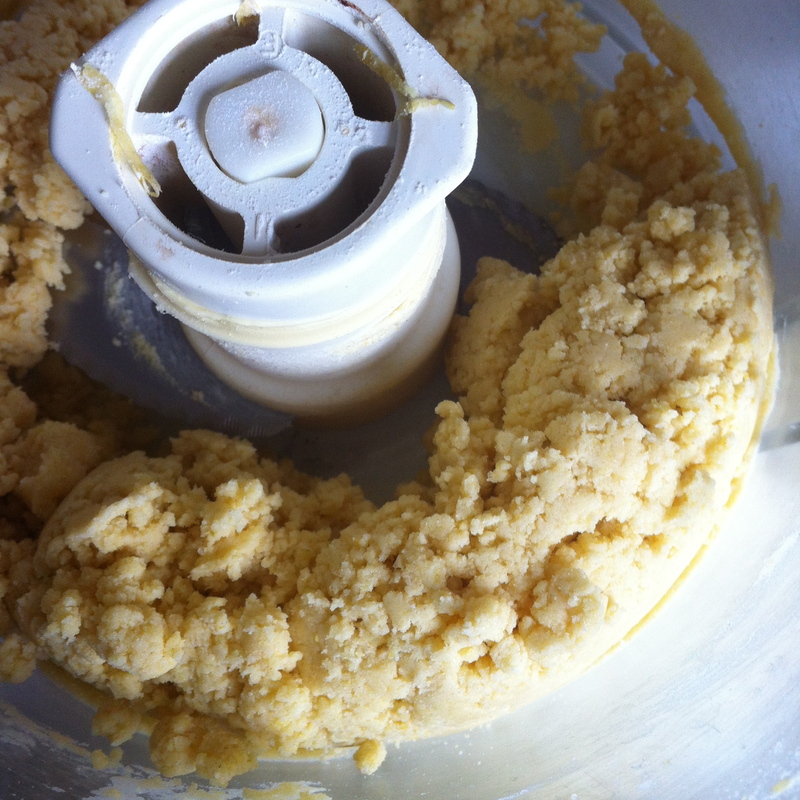 This makes them firm up other wise the butter which has become soft again from being rolled out, will melt too quickly in the oven and the biscuits will spread out and lose their shape. Now is the time to turn the oven on so it can heat up. 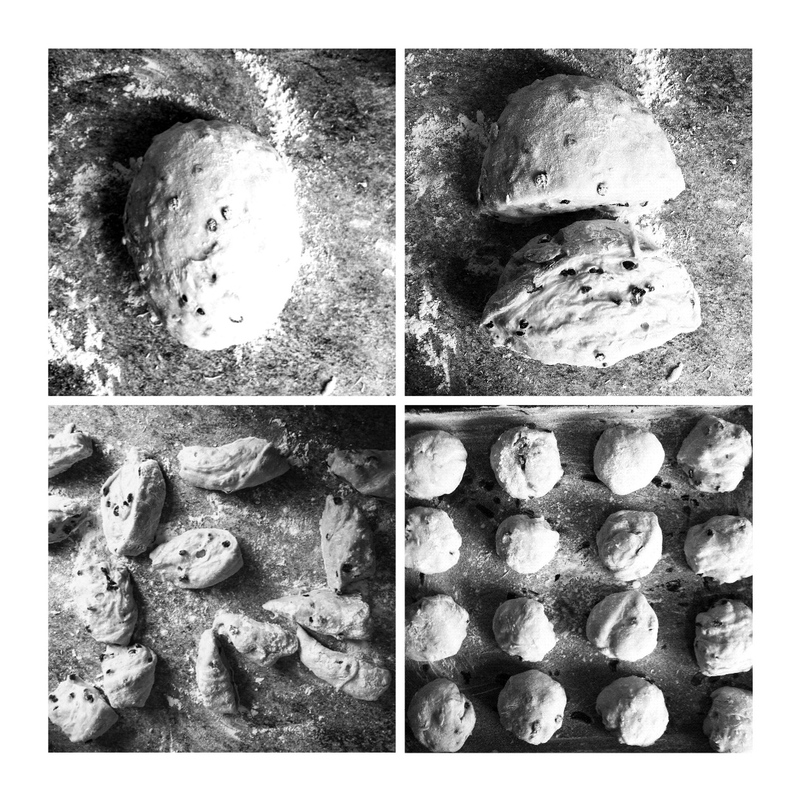 When the biscuits have firmed up put them in your pre heated oven for 10-15 minutes. Keep checking them! You want them to be a lovely golden brown colour. 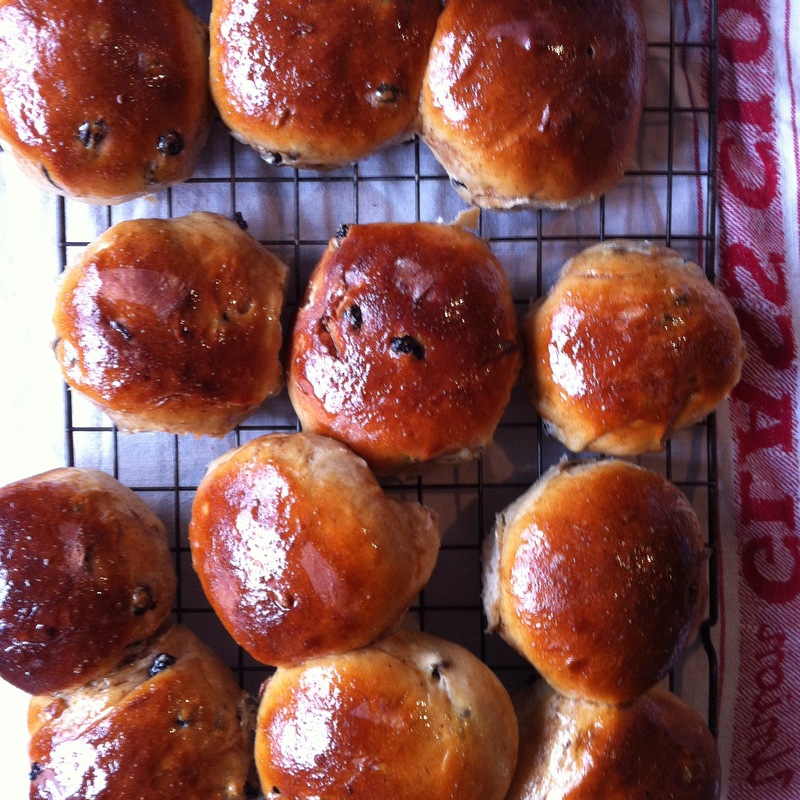 When they are ready take them out and put them on a wire rack to cool and sprinkle them with a little bit more caster sugar. When they are cool. EAT THEM! Yum Yum. 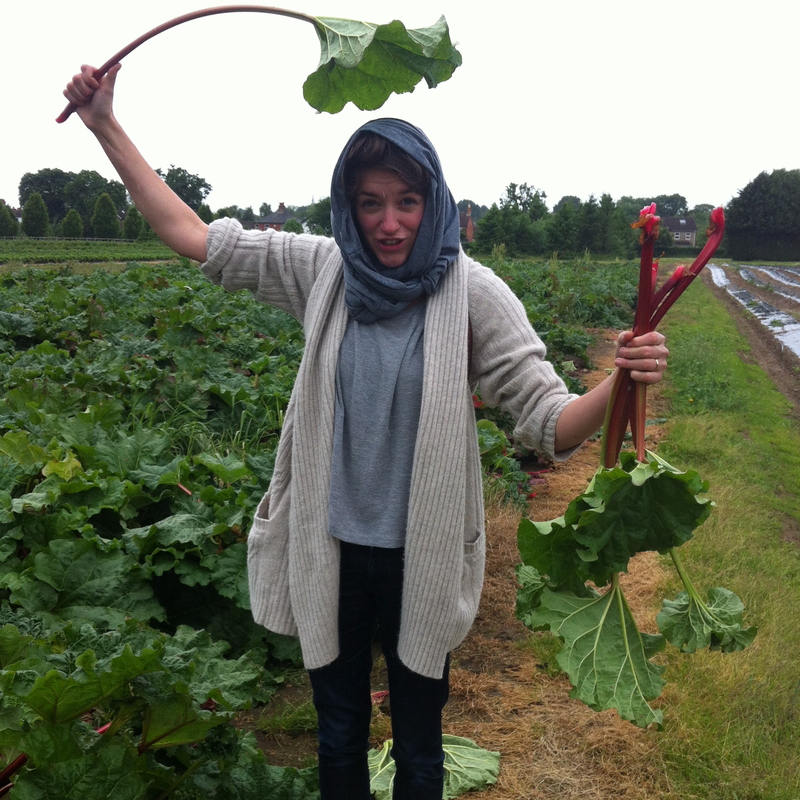 We went fruit picking the other week! 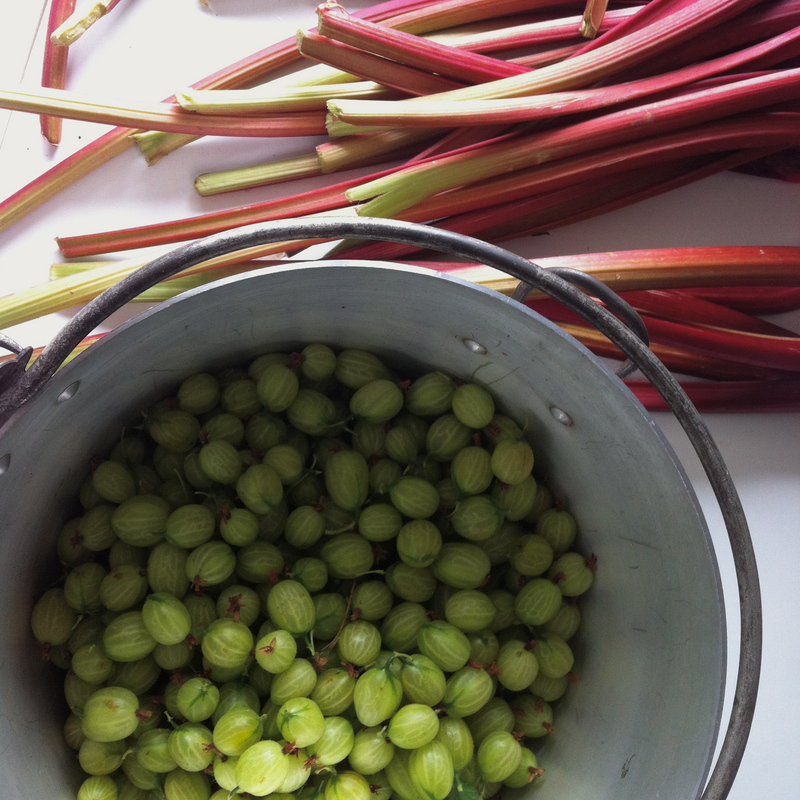 The only thing that was really plentiful due to our BEAUTIFUL British summertime (sigh) were the gooseberries and rhubarb, so of course I picked the most ridiculous quantity I could and brought it all home in readiness for kitchen fun. 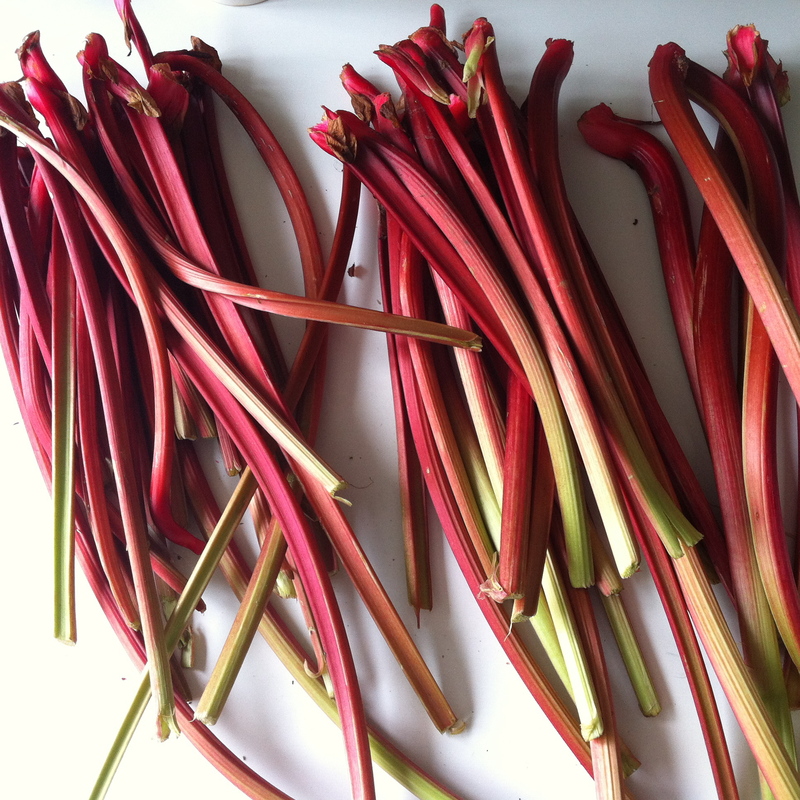 I’ve separated the stems into thin, medium and thick so I can use the more delicate stems for desserts when I want pretty poached rhubarb in it’s natural shape or thicker stems for squadging under pastry or crumble in winter time. Now jam. Jam is really anyone’s game, it is so easy to make but just make sure the fruit you are using has enough pectin to set. Raspberries and strawberries, for instance, are low in pectin, while apples, citrus fruits, gooseberries and currants are high. If your fruits are low in pectin you can add lemon juice or use a jam sugar with pectin added to assist the setting process. Amazing info on this website www.jamworld.co.uk That’s right… Jam World. I’d like to go there! 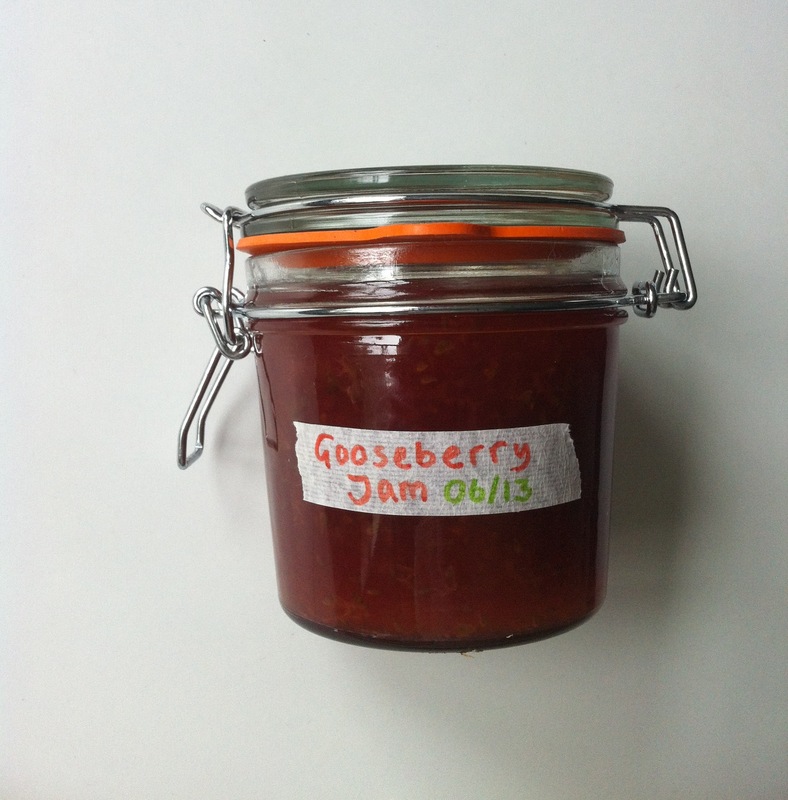 Gooseberries have a high pectin level so expect your jam to set within about 8 minutes of boiling. I use a jam thermometer to measure mine but the frozen saucer trick works just as well. Put a few saucers in the freezer before you start cooking the jam. When it starts to look ready (see note about colour below), take a saucer out of the freezer and put a small dollop of the jam on the surface. 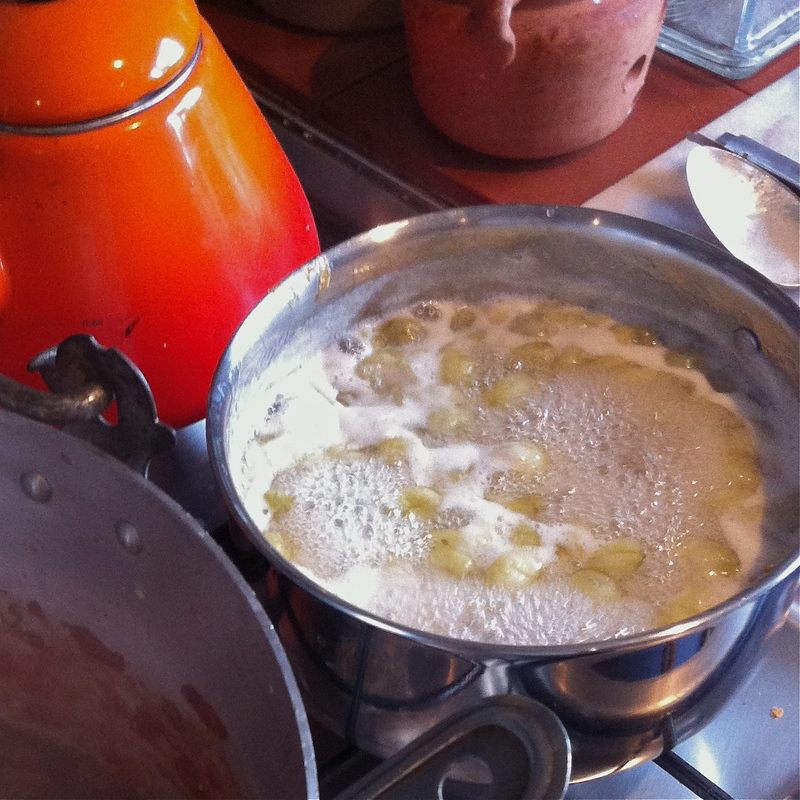 Leave it for a minute (take the jam off the heat while you do this) and then gently push the edge of the dollop. If it wrinkles, it’s done! Wash and pick over your berries. You want to cut off the little brown stalks on each gooseberry. It takes time, but put the radio on . To a lovely and unexpected rosy red. When the jam is ready. Put it into sterilized jars and ENJOY! 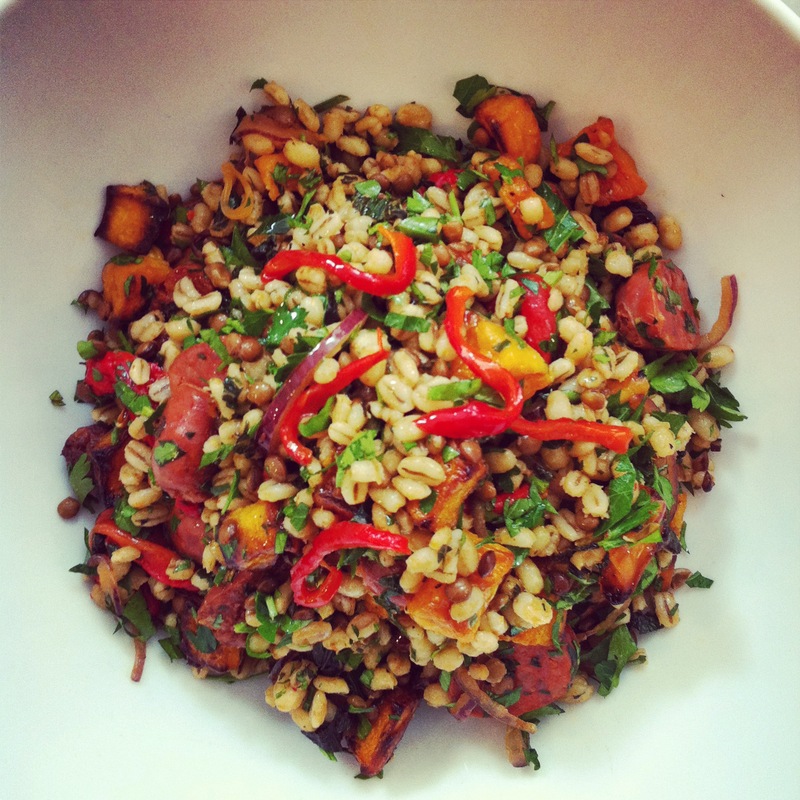 Don’t forget to visit www.pexmas.com for the latest info on the #MUNCH food festival! Coming up in less than 2 weeks! Eek! So it’s one year (plus a bit) later and I think I’m past the apology stage so I’m just going to jump right in! Last Christmas my dearest friend and colleague in crime, Sarah suggested we do something FUN. We plotted and schemed and decided that a festive market was just what Peckham (and our work lives) needed, so Pexmas was born. Pexmas Festive Market was held at The Dye House in Peckham to an audience of 2,000 merry shoppers. We had stalls selling everything from bespoke chocolate brownies to Bauhaus inspired jewelery; Sarah and I developed the worlds most delicious mulled wine and I squirreled away in my kitchen every night making 1,000 Tudor Mince Pies (first seen at my Tudor Feast). 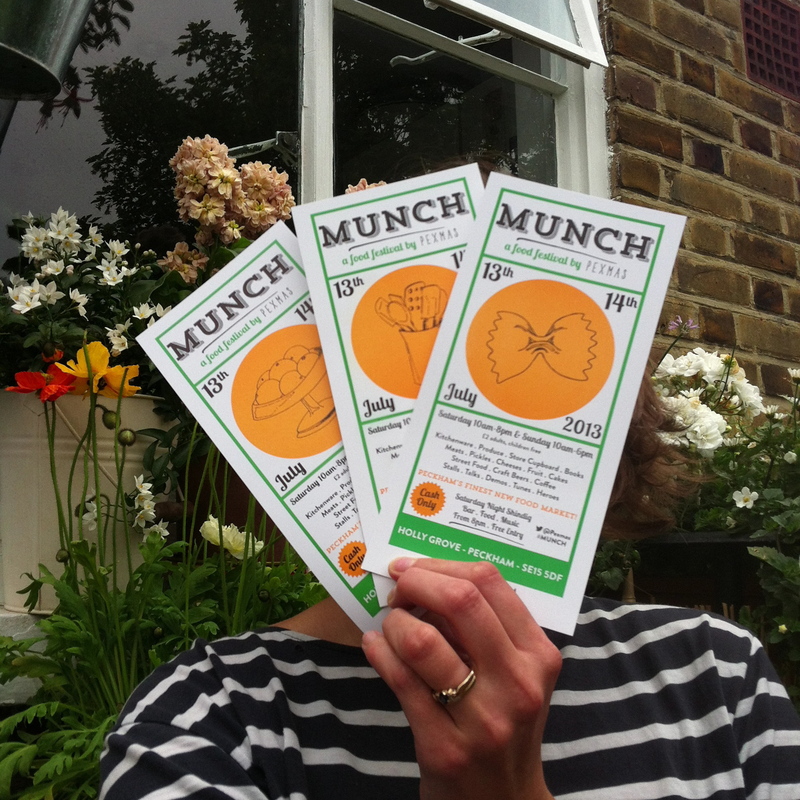 It was just too good to not do another so we formed a company with our Dye House friends Nicky and Guy and now we are launching our next market into the world: MUNCH! 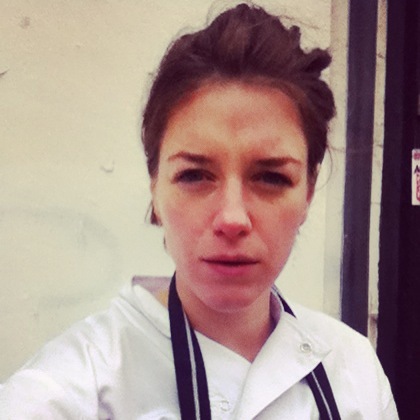 A fantastic phenomenal foodie market, right in the heart of Peckham. 13th – 14th JULY 2013 MUNCH is coming. A food market with a whole lot more… Talks, workshops, demos, street food, fresh produce, cheese, brownies craft beer, kitchenware, tableware, tupperware! 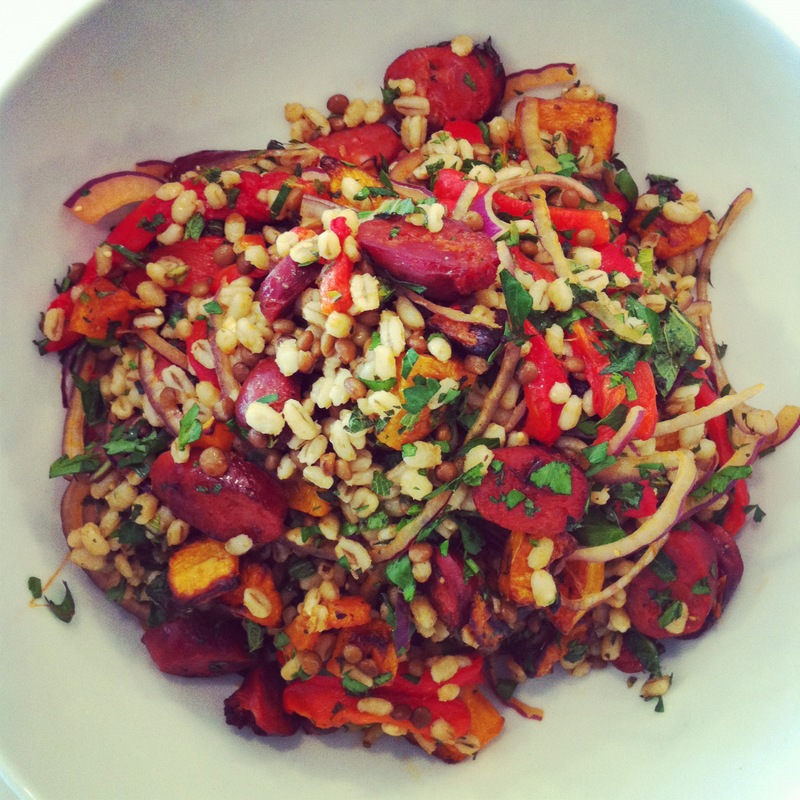 So you must ALL come and sample the fine delights MUNCH has to offer. To promote and spread the word about Pexmas our collaborator in crime John Quilter came up with the idea of a massive pie fight, and of course we couldn’t resist that! 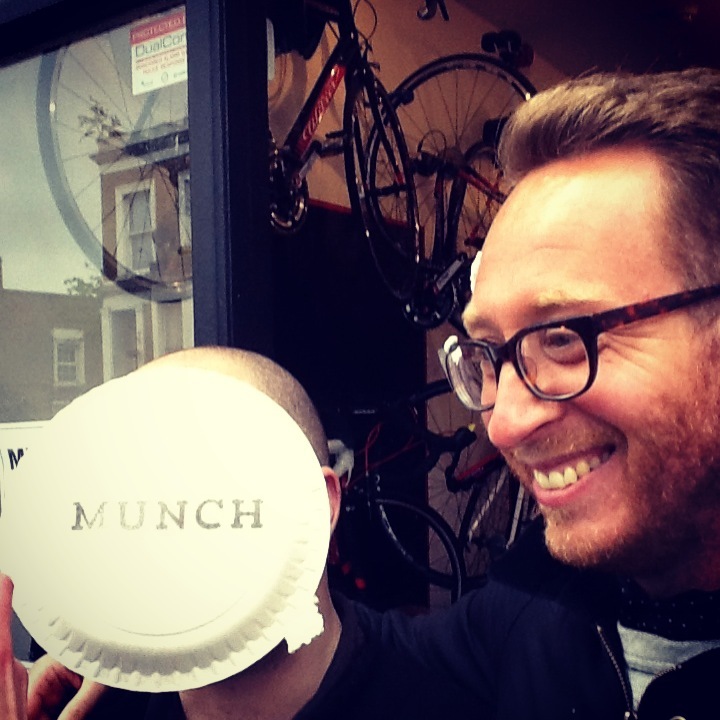 He’d throw the pies, we’d spread the word and hopefully pie themed publicity chaos would ensue! 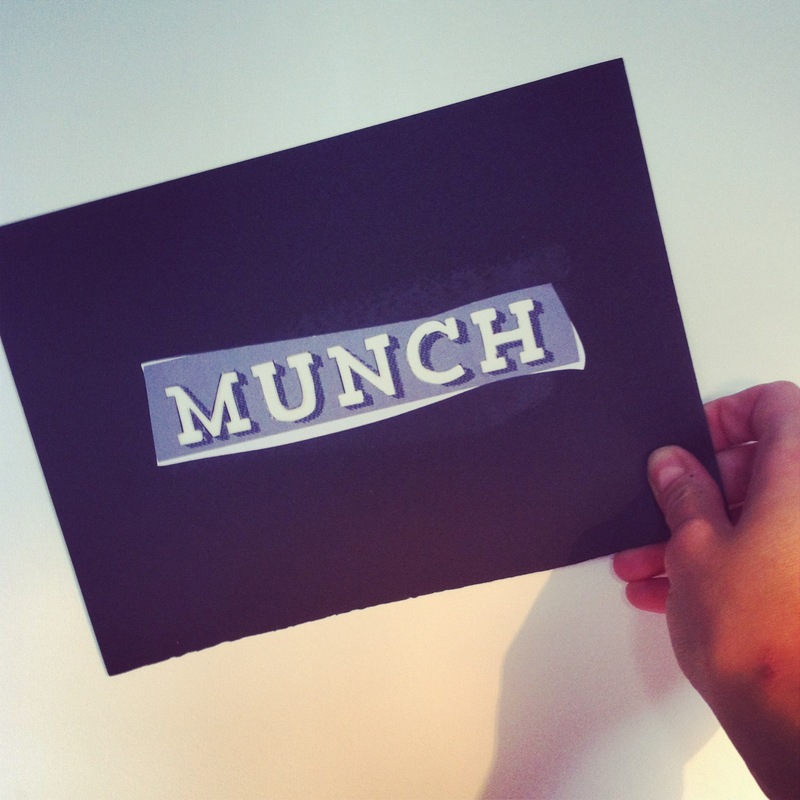 How to make a #MUNCH #PIE ! First take your finest logo and slice it diligently into a template! 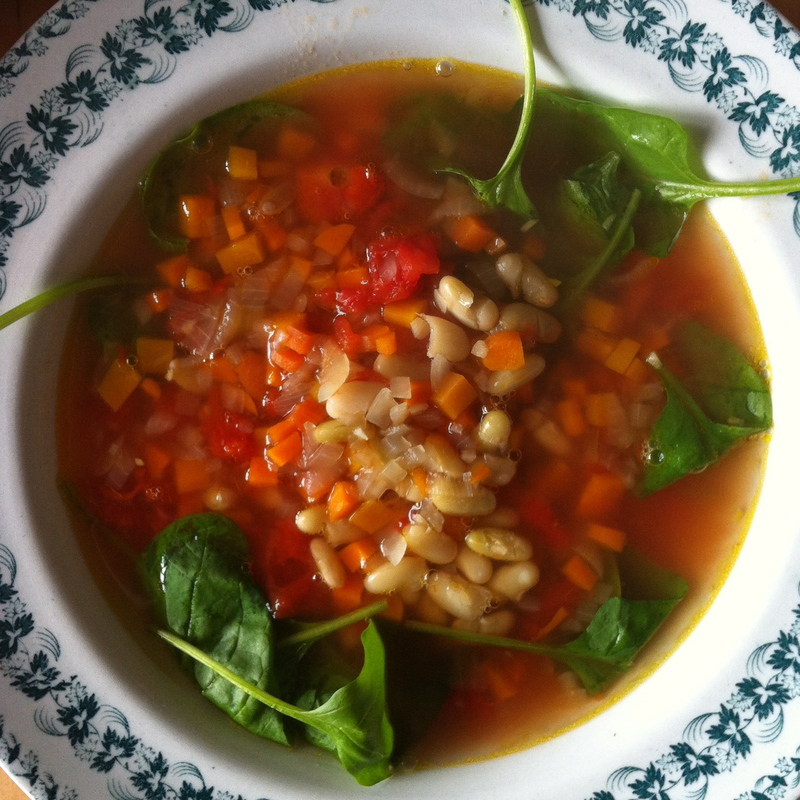 I know, I know, this is HARDLY a recipe of my usual calibre (!) 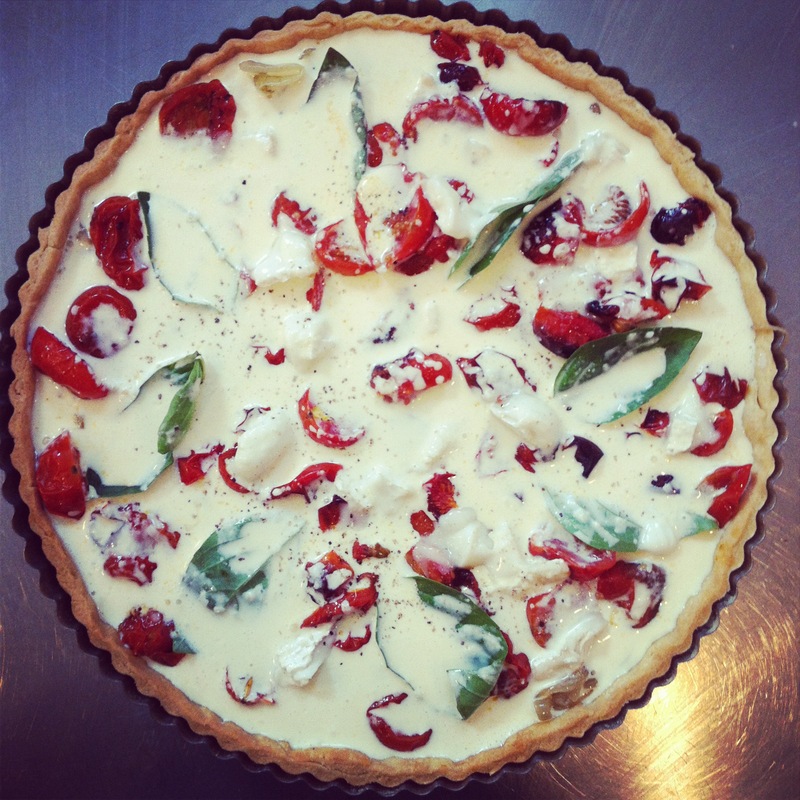 but I urge you all to go out there and take a pie for the team… the Pexmas Team! #MUNCH #PIE and next time, I promise a REAL recipe. Maybe even a real custard pie. Now that’s a pie I would get behind, or in front of!